Being a new writer myself, I have tried to offer my support for others who are in similar circumstances. Although I don’t read as often as I would like due to time constraints, I have recently read a few of these books. Today, I would like very much to tell you about one of these, a fantastic book, entitled: Menopause in Manhattan. There are no vampires in this one, nor are there werewolves, ghouls or serial killers of any kind. Instead, there are simply men and “women of a certain age”. Author Anne Kleinberg is a new friend of mine who I met on the blogosphere. She is a New Yorker who now lives in Caesarea, Israel. She came to the writing of Menopause in Manhattan through an altogether different route. A friend and editor suggested that she write a murder mystery, with a cook at the center. Although Anne was reluctant at first, an idea was hatched. The attempts to fulfill that original request soon became a story about a 50-year-old woman who goes through some major changes in her life. Anne grew up in Laurelton, Queens New York. Her junior year was spent overseas at Tel Aviv University which sparked her love of Israel. A few years later, she went back to school (Fashion Institute of Technology) in Manhattan where she earned a degree in interior design. Anne pursued that design career in New York City; however, she suddenly decided to start over in Israel. “Call it epiphany (or) call it lobotomy,” she says, but she packed up her Shih Tzu and her drafting table and off she went. A restaurant review that she wrote for the Jerusalem post led to a career as a lifestyle journalist, where she wrote about food and people. That led to editing and translating books which then led to writing cookbooks. She’s written four to date, and Menopause in Manhattan is her first novel. I met Anne last year and followed her progress as she worked on editing and then the formatting for this novel. Upon its release, I found myself purchasing a copy due to several factors. The first reason was my wanting to support a buddy. The second was my desire to read something new. Lastly, with lingering memories from having just visited New York City this past March, I was intrigued by a return to that wonderful city – even if only within the virtual pages of her book. Perhaps because it was from an author I know or because I’m just a big softy, I don’t know, but I thoroughly enjoyed this book. With life-like characters that I loved being surrounded by and some of the most realistic dialogue I have ever read, I just couldn’t get enough of this novel. Kleinberg wove her wealth of experience and learned skills into a story that I found to be rich in detail. Consistently, we get the best and worst of interior design, food and fashion; as well as the feel of both New York City and Israel, which all work together to enrich the plot and transport us right into the heart of this tale. Kleinberg worried that there might be too many Jewish references, but I thought it was handled very well. As far as I was concerned the Jewish culture presented in the novel was just one more beautiful strand of detail. It is difficult to pin down just which genre this novel fits with. It gives you the tender warmth and emotion of Nicholas Sparks, but also a flavor of things that perhaps only Kleinberg herself could deliver with such a diverse background. If you find yourself in a place where you’d like something new to read, you’ll find this gem over at Amazon.com in the Kindle Store for only .99 cents. I was intrigued from the first chapter, loved the way she handled flashbacks, laughed aloud several times and felt as if I had gone on a grand adventure. Support Indie Bookstores-click here to buy this book! It’s been on my to be read list on goodreads. Thanks Jimmy! Seriously, it’s a great read! Thanks for the review. I love reading about stories of women during menopause, whether in a novel, a memoir like “Eat Pray Love” (though she wasn’t quite that old) or a book meant to help others like ‘Midlife Crash Course” by Gail Feldman (my favorite)! 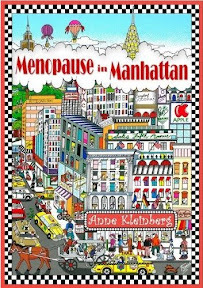 I’ll definitely put “Menopause in Manhattan” on my to-read list. Thank you for the note, Tiffany. I really enjoyed these characters and their perspective. The dialogue was completely believeable and gripping. I hope you’ll like it.